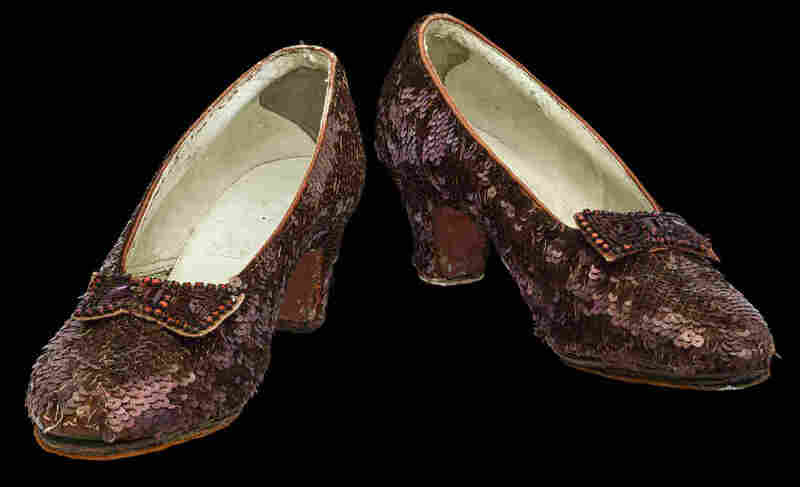 Save The Ruby Slippers: Smithsonian Seeks Funds To Preserve Dorothy's Shoes : The Two-Way The National Museum of American History says it will cost $300,000 to protect the aging shoes from The Wizard of Oz. A Kickstarter campaign launched three days ago has already raised nearly $200,000. The Smithsonian is raising funds to preserve one of its most popular and iconic exhibits: a pair of Dorothy's ruby slippers. "Movie costumes and props are made quickly and cheaply, to last only for the brief duration of the shoot, not forever. Now in their eighth decade, the shoes are fragile and actively deteriorating. Even to the naked eye the damage is quite obvious: the color has faded and the slippers appear dull and washed-out. The coating on the sequins that give the shoes their hallmark ruby color is flaking off its gelatin base. Some threads that hold sequins in place have broken." 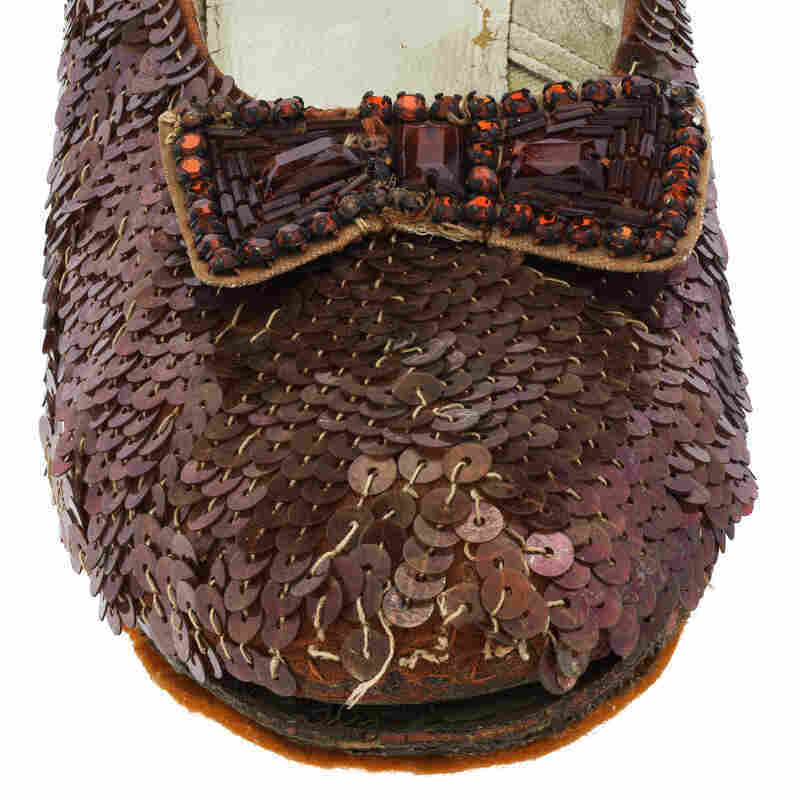 The goal is not to restore the slippers to an earlier, more pristine state. Instead, the museum wants to fund research and work to determine how to "stabilize" the shoes and stop any more damage. That means figuring out the right temperature, light and humidity conditions for the shoes and building a new case to maintain that environment. The museum's head of conservation told The Associated Press the case would probably need to contain a gas other than oxygen and have controls for barometric pressure. "While the slippers undergo treatment their appearance will not change drastically, and we don't want them to," the Kickstarter summary says. The idea is they'd remain as they are now for "another 80 years and longer." And why does the public need to chip in, since the museum is federally supported? A press release from the Smithsonian says federal funds support the museum's core functions, like building operations and staffing, but that the Smithsonian "also relies on private donations to support many of its priorities, including the conservation and exhibition of precious objects such as the Ruby Slippers." This is the second major Kickstarter campaign from the Smithsonian museum. Last year, it crowd-sourced well more than half a million dollars partly to preserve and display Neil Armstrong's Apollo 11 spacesuit. The ruby slippers at the Smithsonian are among five known surviving pairs of red shoes from the film production (including the "Arabian Test Pair," in a more ornate style, which was made for the movie but never actually used in the film).